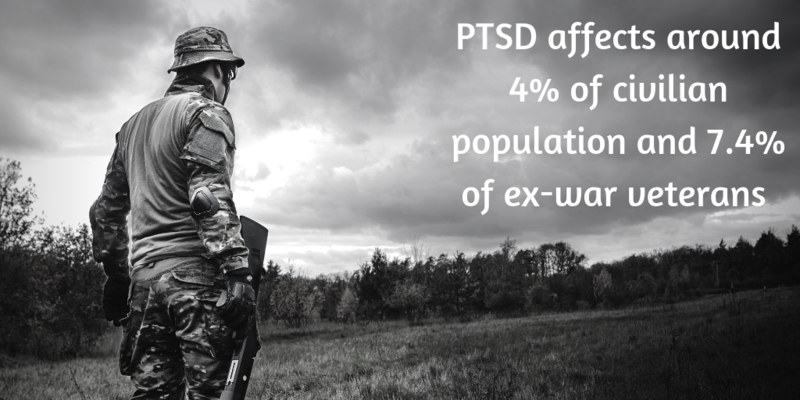 Post-traumatic stress disorder affects approximately 4.4% of the world’s population, this is around 320 million people. It can affect people of any age, gender or background, although a lot of people think of soldiers when it comes to PTSD. Yes, it is more common for war veterans to experience PTSD, but the condition is in no way limited to this one specific group of people. Due to the fact that we are all individual human beings, with various personality types, we are bound to find different situations more or less traumatic than other people do. Something that I portray as being traumatic, may not affect you in the same way and vice versa. These are not the only incidents, but a few of the most common ones. There are many different symptoms in relation to PTSD, you may not experience all of these, but may experience a couple of them. Vivid flashbacks – making you feel as though you are experiencing the trauma all over again. Intrusive thoughts and sometimes images. Nightmares in relation to the traumatic event that you experienced. Feeling intense distress when being faced with real and symbolic reminders of the incident. Feeling physical sensations such as pain, sweating, trembling and nausea. Becoming easily upset and/or angry. Being jumpy and easily startled. Avoiding certain people and places that may trigger memories of the traumatic event. Trying to keep yourself busy all of the time. Feeling emotionally and/or physically numb. Being unable to express affection. Finding it hard to put your trust in people. Feeling as though no one understands. Blaming yourself for the evens that took place. Feeling overwhelmed, anxious, angry, sad or guilty. It is normal to feel upset and confused after experiencing a traumatic event. However, if you are still experiencing issues 4 weeks after the event, you should arrange an appointment with your GP. Or if you feel as though your symptoms are not typical, or you think they are particularly troublesome, then you should make an appointment as soon as possible. PTSD can be treated via both medication and psychological therapies (often Cognitive Behavioural Therapy), it is important to remember that such treatments may not show signs of working in the early stages, treatment takes time and hard work but recovery can be reached. By speaking to your GP and being open and honest about the symptoms that you are experiencing, they will be able to come up with the best care plan for your needs. You may be assigned a community mental health team who will be able to assess various areas of your recovery, dealing with medications, therapies and other activities that may help you along the way. They will also be able to advise you on local group therapies and activities for you to take part in as well as offering you resources such as helpline numbers for the days that are particularly difficult. There is no shame in speaking up and asking for help. Mental health is just as serious and physical health and you deserve the help that you need in order to get better.